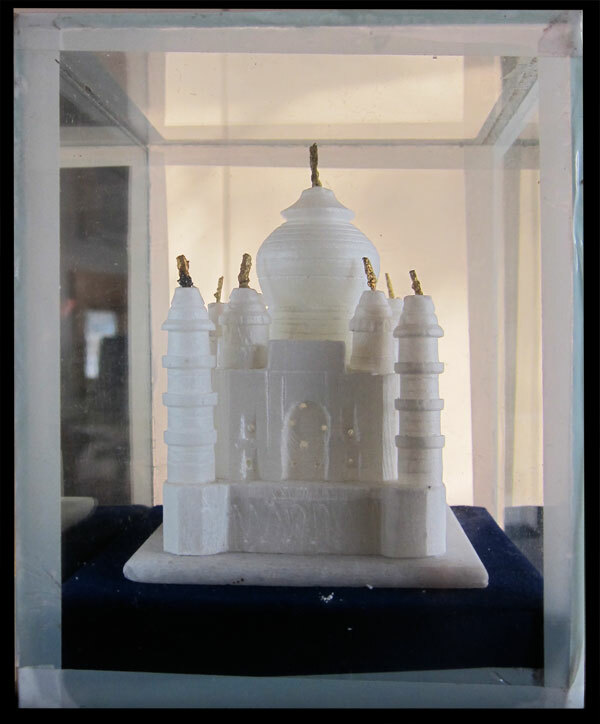 The Taj Mahal, in Agra is a building that has always made us yearn to visit India. People who have seen it say it is so gorgeous, so white, so stunning, that it stops you in your tracks. A friend visited there and brought us this neat little sculpture of it, made of sandstone. The real building is made of pure white marble. It is a mausoleum, built by an emperor of India in memory of his wife who had died. A mausoleum is a structure built to honor the dead, where a body is often buried, above the ground, not in the earth, like a tomb. The Taj Mahal is a combination of architecture styles, including Persian, Indian and Turkish which adds a great deal of adornment and decoration to the structure. As an Islamic building, the architects had to abide by the rule that you cannot decorate buildings with images of humans (also known as anthropomorphic forms). So, no gargoyles with human faces, or human strongmen to act as a column, like you see in various buildings around Europe or the US. Instead the decorations are abstract, geometric, leafy or they use calligraphy.The result is some amazing patterns and designs.